Daniel Mannion of Killererin attempts to stop Salthill Knocknacarra’s Alan Kerins in Sunday’s semi-final of the Galway Senior Football Championship. Photo: Mike Shaughnessy. Salthill-Knocknacarra were far too strong for a disjointed looking Killererin in the county senior semi-final last Sunday at Tuam Stadium, winning comprehensively on a scoreline of 3-10 to 0-10. It was a solid performance from Gerry Hughes's side and they will now face Tuam Stars in three weeks’ time in the county final. Salthill last won the county final in 2005 before they went on to win the All-Ireland club title the following March against St Galls, and they would dearly love to add another Frank Fox to their collection. They have won the county title on two occasions, 1990 and 2005. Three of the Salthill forwards who played in the 2005 county final victory over Cárna/Caiseal, Alan Kerins, Seán Armstrong and Seamie Crowe, are still going strong seven years later, and all played key roles in getting their club back into another county decider. Seán Armstrong had a very fine game and his direct running and smooth play from centre-forward had the Killererin rearguard in all kinds of difficulty. His point with the outside of the boot from a really tough angle before half time, was one of the highlights of the game. Alan Kerins, too, worked very hard for the cause and his fitness levels, work-rate, and use of possession is a key tool in the team's artillery. However it was Seamie Crowe, who notched 2-5 over the hour, who was the one forward on whom Killererin could not keep tabs. Crowe may not always win the dirty ball and he has had his critics on occasions, but he has a really sweet left peg and a great eye for goal. When he is getting good supply and is on his game, he is one of the best forwards in the county. From the outset it looked as if Salthill were going to have too much pace and fitness for the 2010 champions. John Boylan made a big impact around the middle of the field and with Gearóid Canavan and Finian Hanley shoring up the middle of the defence, Killererin were struggling to made inroads on the scoreboard. Indeed once Padraic Joyce blasted a penalty off the woodwork midway through the first half and Salthill scored from the rebound, the result looked set in the stars. Salthill had enjoyed a tremendous start when their hardworking midfielder David Tierney, who played in that position with the Galway hurlers in the 2001 and 2005 senior All-Ireland finals, raced through to hit a stunning goal past Alan Keane. The 2006 All-Ireland club champions led by 1-5 to 0-6 at half time and, once they got into their groove in the second half, they were never going to be stopped. It is a team with a good bit of strength in depth and they were able to bring on good subs in Conor Halloran, Gary Cox and Ruaidhrí McTiernan. They will know that they will have to improve on what they produced last weekend to beat Tuam Stars in the final, but they have the capacity to do that. In Armstrong and Crowe they have two genuine scoring forwards and if those two really hit form on the one day, they will be hard stopped. They are good defensively too and Tuam will not have it all their own way in the final. The probability that midfielder John Boylan will be away for the final is a blow to their chances of glory as Tuam are well served in that area by Paul Doherty, David Connern and Gary O' Donnell. After being defeated heavily last year by Salthill in the championship and again this year, it looks like it could be the end of the road for this great Killererin side that brought such pride and glory to their parish. 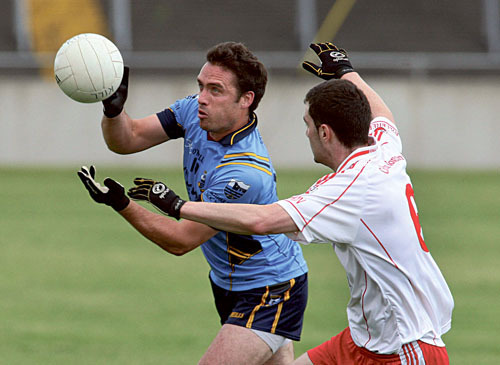 A few of their elder statesmen have four senior county medals (1999, 2004, 2007 and 2010 ), which is a great haul. However, nothing lasts forever and players like Alan Keane, Padraic Joyce and Tommie Joyce have been at the coalface of club football for a long time - all three also won All-Ireland medals with Galway in 2001. Nobody is writing that trio off, but if Killererin come back and win another county final in the next year or two, Lazarus will have met his match. Salthill-Knocknacarra: C Connolly; C Begley, F Hanley (captain ), K Conlon; B Malone, G Canavan, D O'Flaherty; J Boylan (0-1 ), D Tierney (1-0 ); A Kerins, S Armstrong (0-2 ), T Burke (0-1 ); S Crowe (2-5, 1-0 penalty ), B Conlon, C Healy (0-1 ). Subs: C Halloran for Malone 28 mins; R McTiernan for Canavan 51 mins; G Cox for Kerins 55 mins; G Ó Leidhinn for B Conlon 60 mins; R Conlon for Burke 60 mins. Killererin: A Keane; A Nolan, D Kelly (captain ), C Forde; I Reddington, D Mannion, D Flaherty; T Joyce (0-1 ), T Flynn (0-1 ); J Keane, N Joyce (0-3, 0-1 free ), M Boyle; S Hughes (0-1 ), P Joyce (0-4, 0-3 frees ), G Butler. Subs: T Hughes for Butler 50 mins; M.Keane for T Joyce 56 mins.